Real life solutions for how to get rid of fleas ticks and bed bugs and treat flea bites on humans and dogs plus photos of how to identify each pest. Being pet owners, the first time we had fleas on our dog, I panicked. 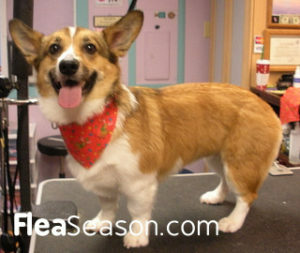 Fleas were everywhere and I had to go online to find how to get rid of the fleas both on my Welsh Corgi, and in the house. It was a long and frustrating process, so now that our dog and house have been flea-free for several years, I wanted to provide information and resources I have found to be helpful and flea products I’ve used that worked when we had to get rid of fleas. Through the years, I’ve discussed in-depth with Veterinarians, animal hospitals and friends about Fleas, and the best way to get rid of Fleas. I have friends and family with stories about how they dealt with Ticks, Tick Bites, and Bed Bugs … and while each person had a different experience with these pesky bugs – it’s important to understand the basics to keep your pet, home and yard pest free. My hope is to make your Flea, Tick and Bed Bug experience as painless as possible. I always like to hear from others, so feel free to email anytime, and share your experience with fleas, ticks or bed bugs. I’ll post your info on this site, so others can learn from your bug journey too.